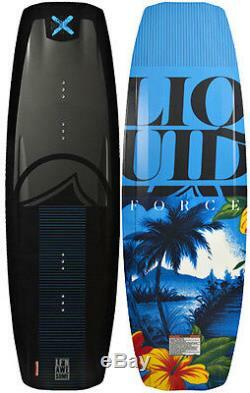 2016 Liquid Force Peak LTD Wakeboard. EXPAND YOUR RIDING AND FREE YOUR MIND ON THIS NEW POPULAR SHAPE! Nico's weapon of choice, the PEAK, is designed to allow him to showcase his unique riding style in the park. The PEAK features an all-wood core with a unique hull shape that allows Nico to ride finless in parks with complete control. If you prefer to ride finned up, the PEAK lets you edge as hard as you can with positive hold. Mid-body edge channels and a concave beveled edge complete the package to keep your PEAK performance in control and catch-free on any of your local park's features. Dialed in a bit stiffer than his past boards to match Nico's new flex preference, you'll feel in control on this popular shape. Established in 2002 S2AS has become known, as the rider owned rider run extreme sports leaders in the UK. S2AS is perfectly located in Poole, Dorset only 20 minutes from the only full Wakeboard cable on the south coast where you can demo all of the Wakeboard equipment we stock in store. This is a not just another watersport this is a lifestyle. S2AS is not just a kitesurf school in Poole, Dorset, Water or snowboard sports shop were a lifestyle brand. Our team lives and loves what we do, If were not teaching kitesurfing or in the shop were at the Wakeboard cable on the beach Kitesurfing or taking trips to the snow. Were putting in the groundwork constantly testing and proving our knowledge so that we can provide the best quality equipment on the market to you. We don't stock anything that we don't believe in, We understand the need you have to find gear that you're going to enjoy and trust riding every time you go out. We spend days testing so you don't have to. Some of the top brands that we stand by are Cabrinha Kites and Slingshot Kites for kitesurfing. They have an amazing build quality for a product that is going to last. Have fun from all the Team at Surface 2 Air Sports (Rider owned Rider run). Cash on Collection in our store in Poole, Dorset open 7 days a week. If there is going to be a delay for any reason, we'll let you know as soon as we can. If you order after 2pm, we'll still try to despatch that day but, if we can't, we'll despatch the following day. Items ordered after 2pm Friday or over a weekend will be despatched Monday. If you cannot thoroughly check the goods please sign for as'unchecked'. It is your duty to inspect and confirm that the goods are in good condition before signing. If the goods are damaged and not singed for as such, Surface 2 Air Sports cannot accept any liability and the item will not be replaced or reimbursed. Please send any item(s) you intend to return in the original packaging. Address: 14-16 Station Road, Ashley Cross, Lower Parkstone Poole, Dorset BH14 8UB. The item "2016 Liquid Force Peak LTD Wakeboard" is in sale since Sunday, September 11, 2016. This item is in the category "Sporting Goods\Waterskiing & Wakeboarding\Wakeboards & Kneeboards".